Scott Walker: Wisconsin's low job creation numbers could be a problem for the presidential hopeful. Does Scott Walker Have a Jobs Problem? Wisconsin Gov. Scott Walker at his 2014 election night party. Forget the Liz Mair kerfuffle: The trickiest news for Scott Walker this week is the Wisconsin job creation numbers. Which were bad. The Quarterly Census of Employment and Wages shows Wisconsin tying with Vermont and Iowa for 38th place in the nation for creating jobs. In the previous quarter, Wisconsin was 31st in the nation for job creation. So that’s a tumble, from low to lower. In its coverage, the Milwaukee Journal-Sentinel notes that in the Midwest, Wisconsin and Iowa are tied for last place in creating private sector jobs. This could present some challenges for the Republican governor and likely 2016 presidential contender. And this quarter’s numbers aren’t the only vulnerability for Walker when it comes to his economic record. The governor famously promised during his 2010 campaign that the state would create 250,000 private-sector jobs if he got elected. That didn’t happen. Instead, as the Capital Times reports, the state saw 137,400 new private-sector jobs in Walker’s first gubernatorial term—a little more than half of what he promised. That’s not to suggest that Wisconsin employment numbers are all bad news. The state’s unemployment rate has been falling since the governor was elected in 2010, and it’s below the national average. AshLee Strong, press secretary for Walker’s PAC, Our American Revival, touted the state’s economic record under the governor. 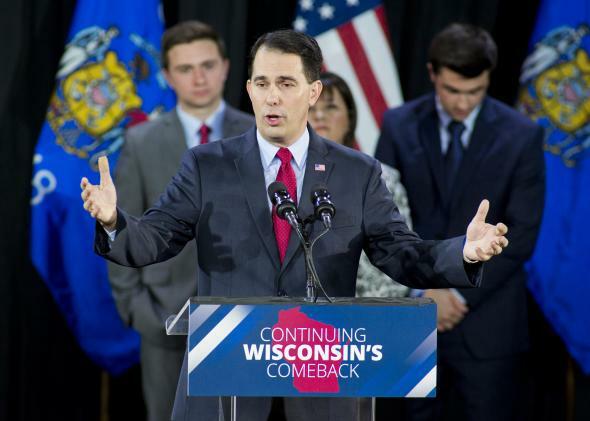 “Under Governor Walker’s leadership, Wisconsin employment is now at an all-time high of nearly 3 million workers, the unemployment rate is the lowest since 2008 at 4.8 percent, and 156,800 private sector jobs have been created according to monthly estimates,” she emailed. Nick Novak of the conservative Wisconsin think tank MacIver Institute also pointed to the state’s low unemployment numbers when I asked him about job creation. It also serves as a reminder that—putting aside inside-the-beltway concerns about staffing—one of the biggest issues for Walker on the presidential campaign trail will be the Badger State economy.